Good morning. We would like to send a big thanks to Robin for guest designing for us this weekend!! Today Robin has an adorable Halloween onesie to share with us. For even more inspiration, please visit Robin's blog – Robin's Creative Nest. is a fun and easy gift to create. Happy World Cardmaking Day! Today we are debutting Amy Tedder's second Baby Set- Bundle of Joy Vintage Labels Five Clear Stamps. Special Thanks to Sharon Johnson for joining us for or release hop today and yesterday and for inspiring our two baby sets this month. Bundle of Joy Vintage Labels Five Clear Stamps is designed to coordinate with our new Vintage Labels Five Die. Debbie Olson designed this elegant baby card using Bundle of Joy Vintage Labels Five Clear Stamps, Moroccan Lattice Background Cling Stamp, Spellbinders Framed Tags One, Labels Twenty Two, and Decorative Labels Twenty Two. Sharon Johnson has joined us again today to share this stunning baby card using Bundle of Joy Vintage Labels Five Clear Stamps along with Vintage Labels Five dies. Marisa Job designed these cute little baby cards using Bundle of Joy Vintage Labels Five Clear Stamps, Special Delivery Clear Stamps, Vintage Labels Five Dies, and Spellbinders Rose Creations for the flowers. Kristi Schurr designed a sweet shaped baby card using Bundle Of Joy Vintage Labels Five Clear Stamps, Special Delivery Clear Stamps,Grand Labels One,Labels One,Scalloped Labels One,Vintage Labels Five, and Standard Circles Small. Kathy Jones designed this beautiful layered baby card using Bundle of Joy Vintage Labels Five Clear Stamps. Kazan Clark designed this amazing baby card using Bundle of Joy Vintage Labels Five Clear Stamps. Her card base is created using Spellbinders Butterfly Magic. Margie Higuchi designed this fun baby card using Bundle of Joy Vintage Labels Five Clear Stamps, Vintage Labels Five Dies, Spellbinders: S4-112 Classic Ovals SM , S5-131 A-2 Matting Basics A and S5-132 A-2 Matting Basics B. Margie reverse stenciled on Vintage Labels Five Dies which she will explain on her blog. Michele Kovack created two cards for today's release. Her first card is a vintage baby girl card using Bundle Of Joy Vintage Labels Five Clear Stamps, Vintage Labels Five die, and with a glittered die cut layer of Becca Feeken's Filigree Corner Die. Michele Kovack designed this sweet baby boy card using Bundle Of Joy Vintage Labels Five Clear Stamps. Eva Dobilas designed this gorgeous baby card using Bundle of Joy Vintage Labels Five Clear Stamps, Vintage Labels Five dies, and Spellbinders Curved Rectangles. Barb Schram always designs the cutest projects and today is no exception. Barb has this adorable baby bib card using Bundle of Joy Vintage Labels Five Clear Stamps, Spellbinders Grand Circles, Lacey Circles, Classic Circles, and Lattice Pendant. Click through to her blog for all the details. Thanks for joining us for our 2013 October Release. Hope you get the chance to get a little inky this weekend. Be sure to stop by our new website and log in to your account and reset your password to activate your JustRite Papercraft account. Today we are very excited to introduce the first of two baby sets in the October Release - Special Delivery Clear Stamps. These sets were a true labor of love, we have had a baby set or two on our drawing board for years – but every year we have worked on it a bit and then we we moved on to another stamp set. This year we got a very big nudge from our dear friend and alumni blog team member Sharon Johnson that we needed a baby set in our collection. Sharon was so sweet she gave us quotes that she would like to have for baby showers and births, and shared with us what types of images she would like to see in the set. Amy and I took those concepts and went back to our baby sets and brought Sharon's concept to life. What started out as a simple 4' x 6" clear stamp set quickly bloomed into two 6" x 8" Baby sets. I can't wait for you to see what the design team has created with today's set - Special Delivery Clear Stamps. A big shout and Hug to Sharon for the inspiration these were so much fun to design! Marisa Job designed this amazing baby girl card using Special Delivery Clear Stamps, Vintage Labels Six Dies, Spellbinders Carnation Creations. Kathy Jones designed this stunning baby boy card using Special Delivery Clear Stamps and Delicate Doilies dies. Michele Kovack designed this adorable baby carriage from Shrinky Dink material using her Silhouette. She added the sweet sentiment and baby rattle from Special Delivery Clear Stamps. Kazan Clark designed this beautiful baby boy card using Special Delivery Clear Stamps and Spellbinders Radiant Rectangles. Eva Dobilas designed this super cute baby card using Special Delivery Clear Stamps and Moroccan Lattice Background Stamp along with Spellbinders Lace hearts dies. Barb Schram designed this adorable party hat and tag using Special Delivery Clear Stamps. The cute tag is cut using Vintage Labels Five dies. Thanks for stopping by today. Join us tomorrow to see design inspiration for our last October Release set – Bundle of Joy. I have another color challenge for you here at JustRite Inspiration where all you need to do is use the inspiration photo and colors (or similar) to create your card or project. I used BEAUTIFUL papers provided by Stamp Simply and a sentiment from Winged Vintage Labels Two & Three cut with coordinating Vintage Labels Three dies. For more details on my card, please check out my blog HERE. The Grand Prize winner for JRC#102 will receive a Stamp Simply Ribbon Store Prize Package featuring a variety of paper, trim cards and embellishments from the Modern Romance Collection by Webster's Pages plus 15 yards of silk ribbon and 20 yards of seam binding pictured below. The total package value is $63.25! The 3 Honorable Mentions for JRC#102 will each receive 1 Stamp Set of choice from the JustRite Store. The Random Draw Winner for JRC#102 will receive 1 Stamp Set of choice from the JustRite Store. CHALLENGE RULES: You will need to use JustRite Stamps on your project and upload it to an online blog, gallery or photo hosting website. You may make and enter as many different projects as you'd like for our challenges. You will then need to link to your project back here on our blog post, using the linking system on this challenge post. Please make certain your link is directly to your project, not just your general blog home page or overall photo gallery, so we can find it easily. (Links that are spam, commercial in content, or are not linked properly/directly to your project will be deleted). If you choose to upload your project to www.Splitcoaststampers.com OR ourFlickr gallery, please use the weekly challenge code (example:JRC_102 <== that's an underscore between the letters and numbers) in the keyword section of the Splitcoast project upload page or the tag section of the Flickr gallery. You will have until Wednesday, Aug 7th, at 6:00 PM Central to make your project and enter a link to it below. Winners will be chosen and announced the next day (Thursday, Aug 8th) here on the JustRite Inspiration Blog. By entering our challenges, you grant JustRite Stampers permission to use your artwork here on our blog as well as our company website gallery (with designer credit given and your blog post or gallery linked) or any possible advertising. JustRite Friday Challenge #100 – "Delicate Doilies"
JustRite Friday Challenge #098 – "Make It Manly"
fabulous set to celebrate this wonderful occasion! ribbon and dimension accent the stamped elements on the cover. paper strip, embellished with a stapled tab die cut. embellishments accent each die cut sentiment. haven’t decided if it will be Gramma’s brag book or a gift for my son. Decisions, decisions! Good morning and welcome to Day Two with Guest Designer Kristi Schurr. Be sure to check out Kristi's blog – Kristi's Paper Creations – for more inspiration. Today Kristi has a really cute baby project for those of you who might have an upcoming baby shower to attend. Hi and welcome to my second day as guest designer at JustRite! Today’s project was made for a baby’s room. I went toward the girly side, but it can also be easily adapted for a boy. This room decoration was made from a picture frame I found in my local discount store. It was already white, so I saved a step not having to paint. You can also use a frame you may already have around the house. I also made a matching card to give along with the frame. Step 1- Create card base from white card stock. Step 2-Die cut bottom edge of the card front with Spellbinder’s dies from the A2 Bracket Borders One set. Step 3-Adhere pink doily paper to top half of card. Add 2 coordinating strips just above the die cut area. Step 4- Stamp banners from the Buntings And Banners stamp set and emboss with white embossing powder. Die cut with matching dies from the Buntings And Buttons die set. Layer them together as shown and attach to card with mini clothespins. Step 5-Adhere felt bunny sticker to doily and adhere to card front. Step 6- Stamp “baby” sentiment from the Buntings And Banners stamp set and die cut with the flag die from the Vintage Label And Banner die set. Add acrylic flower next to sentiment and adhere flag to the bunny. Step 1– Cut a piece of card stock so it fits into the frame. This will be the base. Step 2– Cut two pieces of patterned paper half the size of the base height wise and adhere to base joining in the middle. Step 3– Stamp “congrats” label from Celebrations Label One and Bracket one stamp set onto pink card stock. Emboss in white. Die cut with matching Spellbinders Label One die. Adhere to center. Step 4-Adhere bunny sticker to center of label and attach heart shaped button to center of bunny. Step 5-Stamp “Welcome Baby” sentiment from the Buntings And Banners stamp set in pink onto pink card stock. Die cut with banner die from the Vintage label And Banners die set. Adhere under bunny label. Add small pearl to each side of banner. Step 6– Stamp and emboss bunting and banner from the Buntings And Banners stamp set. Emboss in white and die cut with matching dies from the Buntings and Banners die set. Adhere to the top of frame with a small amount of hot glue or other strong glue. Add pearls between buntings. Step 7– Add crocheted flower to lower right of frame and add a decorative brad to center of flower. JustRite Stamps– Bunting And Banners, Celebrations Labels One And Brackets One. Just Rite Custom Dies–Buntings and Banners, Vintage Labels And Banners. Accessories: Felt Bunny Stickers, doily-Martha Stewart Crafts,Crocheted flower- My Mind’s Eye,Fabric Brad- K And Company. Thanks for visiting today. I hope you like today’s projects. Please come back tomorrow for my final project! Introducing Just Ducky, Custom Dies & December Sales! Our JustRite Custom Dies are now in stock & shipping! You can find both sets HERE. And to celebrate the release of our Custom Dies, there's no better holiday gift than a sale on our Nested Frames & Nested Sentiment stamps that coordinate with our new dies! To go with those Nested Frames & Sentiment stamps, our Clear Horizontal Set of 2 Stampers that are used with the above stamps are on sale 20% off! As you can see, this set will be perfect for kid's birthdays, Valentine's Day, Easter, general love, or just a great "you make me smile" note for a friend or for your child's lunch box/backpack! A card base was die cut from blue cardstock with the largest Large Scalloped Rectangle Nestabilities-Lg die and the duck panel adhered to it. The "Just for You" sentiment is from our All Occasion Nested Sentiments and it was die cut with the tag die from our Custom Dies-Nested Frames. The tag frame was sponged with Pear Tart Memento ink and accented with rhinestones. 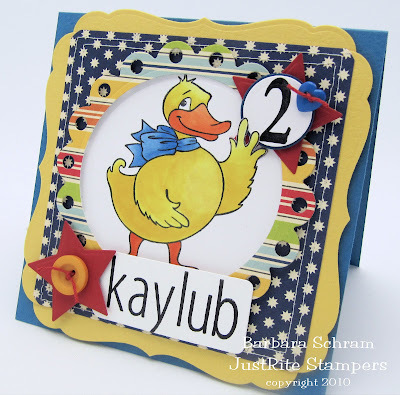 JustRite design team member, Barb Schram, has this adorable 2-year old's birthday card to share — click on Barb's hyperlinked name above to get all the details on how she created her just duckie card! And the sales continue for December . . . we're trying to make your holiday shopping as easy as possible! Accessories: Tsukineko Sponge Dauber, May Arts light blue silk ribbon, Ranger Star Dust Stickles, KaiserCraft rhinestones, foam tape.